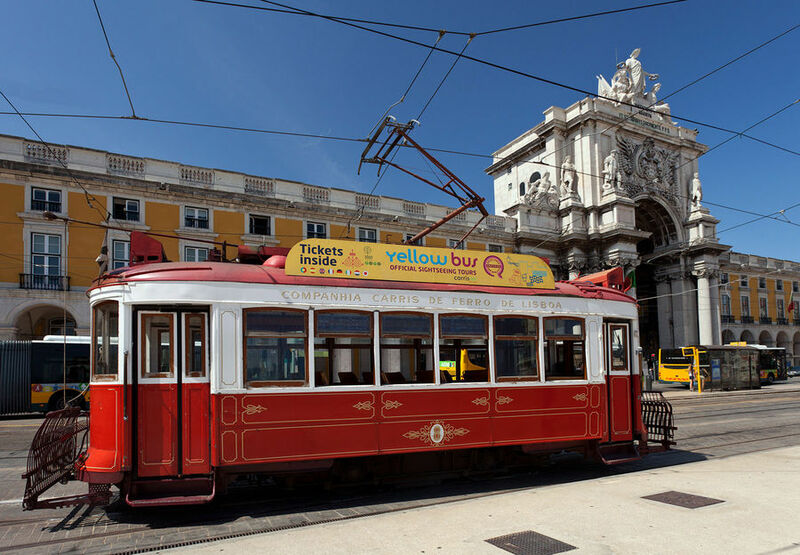 Portugal's capital city of Lisbon feels to me like Europe's San Francisco — it has rattling trolleys, a famous suspension bridge, a heritage dominated by a horrific earthquake, and lots of fog. And like San Francisco, it's a charming mix of now and then. Lisbon's glory days were in the 15th and 16th centuries, when Vasco da Gama and other explorers opened new trade routes to India and Asia, making Lisbon the queen of Europe. Later, the riches of colonial Brazil boosted Lisbon even higher — until an earthquake in 1755 leveled the city, leaving a smoldering pile of rubble. Rua Augusta, the triumphal gateway arch to the city, signals the city's rebirth, and affords a grand view down the main drag. Climbing to the top of the arch, you can see that the center of town was rebuilt in a strict grid plan with broad boulevards and inviting squares. Downtown Lisbon fills a valley flanked by two hills along the banks of the Rio Tejo. Three characteristic neighborhoods line the downtown harborfront: the modern-feeling Baixa (lower town); the Alfama, the tangle of medieval streets on the hill to the east; and the Bairro Alto (high town), on the hill to the west, whose old lanes brim with restaurants, bars, and nightclubs. The city's trolleys provide a fun do-it-yourself orientation tour. Many of the cars are vintage models from the 1920s. Shaking and shivering through the old parts of town, they somehow safely weave within inches of parked cars, climb steep hills, and offer breezy views of the city (rubberneck out the window and you will die). They're perfect for a Rice-A-Roni-style joyride. The essential Lisbon, however, is easily covered and best enjoyed on foot. The Alfama's tangled street plan, a cobbled playground of Old World color, is one of the few bits of Lisbon to survive the earthquake. Its main square, Largo de São Miquel, is the best place to observe this atmospheric quarter. Bent Alfama houses comfort each other in their romantic shabbiness, and the air drips with laundry and the smell of clams. Favorite saints decorate doors to protect families (St. Peter, protector of fishermen, is big here). If you see carpets hanging out to dry, it means a laundry is nearby. Because few homes have their own, every neighborhood has a public laundry and bathroom. Until recently, in the early morning hours, the streets were busy with residents in pajamas, heading for public baths. Today, young people are choosing to live elsewhere, lured by modern conveniences unavailable here, and the old flats are congested with immigrant laborers (mostly Ukrainian and Brazilian) who came during the construction boom a decade ago. With the bad economy, they are moving on in search of employment. 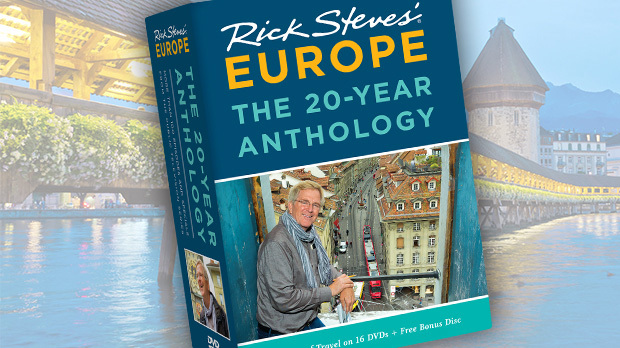 In just a couple of generations, the inhabitants have changed — from fishermen's families to immigrants to young bohemians. 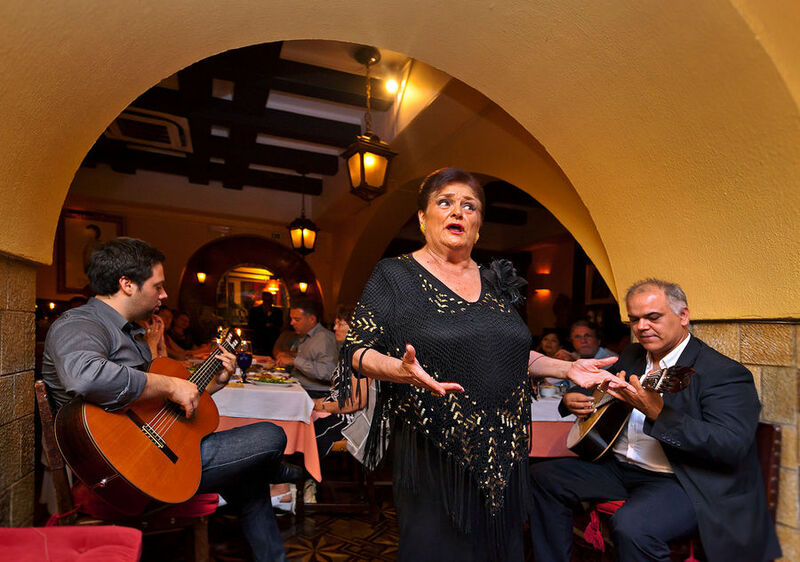 Despite the change in demographics, the city's back streets still host halls for Lisbon's traditional folk music, fado — melancholy ballads of longing and loss, often sung by widows and other victims of fate. I like fado vadio, a kind of open-mic fado evening where amateurs line up at the door of neighborhood dives for their chance to warble. On my must-do list in Lisbon is stopping at a bar to have pastel de bacalhau, a fried potato-and-cod croquet. Bacalhau (salted cod) is Portugal's national dish. Imported from Norway, it's never fresh, and Portuguese kids think it's a triangular fish because of the way it's sold. I think that Portugal must have the only national dish that's imported from far away — strange, and yet befitting of a nation known for seafaring explorers. Another Lisbon tradition is ginjinha, its cherry brandy, sold by the shot. After a drink or two, I find myself doing laps up and down the pedestrian streets in a people-watching stupor. The sidewalks here are set in a mosaic of limestone and basalt. They're an icon of the city, but the cobbles are slippery and expensive to maintain. With the tough economy, the city government is talking about replacing them with modern pavement. Lisboners are saying "no way." One welcome evolution is the kiosk café (quiosque in Portuguese), a standard feature of squares and viewpoints all over town. These old renovated newsstands are now mini-restaurants surrounded by tables and chairs, creating neighborhood hangouts and places for al fresco dining. Judging by the crowds I saw enjoying the spring sunshine, the Portuguese economy is showing signs of happiness. Though ever-changing, Lisbon's heritage survives. 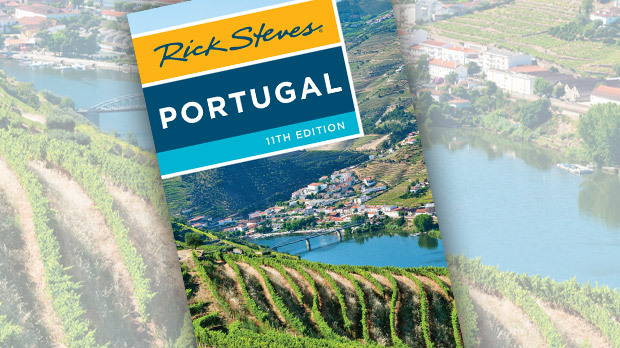 With a rich culture, stunning vistas, friendly people, and a salty setting on the edge of Europe, Portugal remains a rewarding destination for travelers.